Some things in life we can guarantee. Amidst all that uncertainty, those big questions in life – is it going to be warm or cold today? (in Melbourne you can never be sure) do those jeans actually look good on me? (might as well admit we’re all a little superficial at times) do I want cereal or toast for breakfast? (such a dilemma) – there is one thing you can be sure of. With 100% certainty. What’s that, you ask? 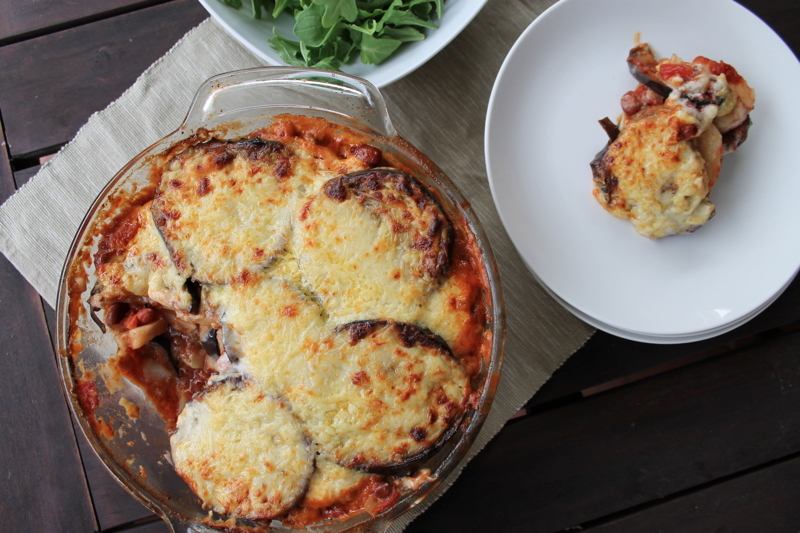 Why, that you won’t miss the lamb mince one bit in this Vegetarian Moussaka. Even if you’re a dead set carnivore. Kidney beans cover your back in the protein department and meld effortlessly with the rich tomato sauce. Cinnamon works it’s thang, transforming a typical tomato sauce into something inherently Greek…a spice not just reserved for the sweeter side of cooking! Soft slices of potato and sautéed eggplant sandwich everything together, with a creamy cheese sauce seeping through the gaps. A decent scattering of cheese – yes more cheese – produce a decadent melty, golden brown topping, that bit you save for last (or eat first if you’re one of those people). You draw the dish from the oven, hot and bubbling, it’s rich aroma permeates through the air…. Tempting as it may be, don’t sink a knife into the Moussaka just yet. Hold back if you can. Try to cut into it straight away and your certain to end up with a messy splat on the plate. Splat doesn’t sound very nice does it? So leave it to rest. Fifteen minutes aint that long. In doing so you allow it to ‘set’, thereby preventing some serious disintegration from occurring between dish and plate. And let’s face it after all the hard work you’ve put in (there’s no denying that it’s a meal that requires a decent amount of time and effort) it’s pretty heartbreaking for it to fall apart on the home straight. To be fair, there’s nothing wrong with a decent amount of good, hard work. It’s constitution building stuff. However, there are some cases where it’s permissible to cut corners. To slack off. Let’s admit that someone didn’t bother to de-gorge (salting to draw out the bitterness) the eggplant slices prior to frying. Now, usually this would be an atrocity. A crime against cooking. However, the sweet, rich tomato sauce in this moussaka more than obscures any remnant bitterness. It’s not in the recipe but de-gorge the eggplants if you still fear that nose-scrunching bitter tang. It’s your call. Whilst we’re on matters of hard work, make sure you’ve got someone gullible lined up to do the dishes…this recipe’s not light on them. Though don’t let that deter you from making i! The flavour more than makes up for all that work, and your dish-washing minion should have little to moan about after you serve them a plate of this moussaka, paired with crisp green leaves and a bowl of salty olives on the side – they’re being treated to one exceptional Greek inspired feast. Preheat the oven to 190C. Grease a 23x23x8cm heatproof dish. Boil the potatoes until just tender – when inserting a knife into the spud you should still feel a little resistance in the centre. Drain, set aside to cool slightly then slice into thin rounds. 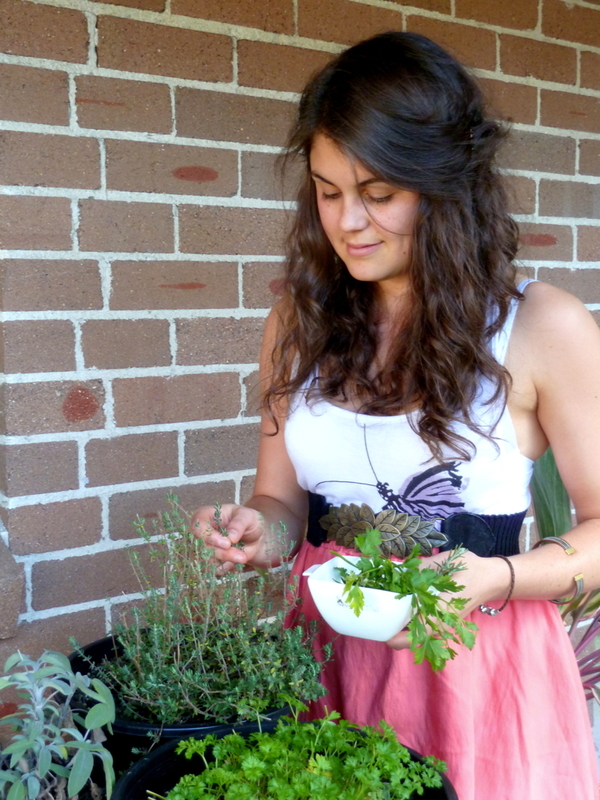 Heat a scant tablespoon of oil in a medium sized saucepan. Saute the onion gently for about 4 mintues or until softened but not coloured. Add the crushed garlic and cook for another minute. Add the tomato paste and cook, stirring, for about 30 seconds or until beginning to caramelise. Deglaze with the red wine and then tip in the chopped tomatoes, oregano, cinnamon and sugar. Bring to the boil and simmer, covered for 10 minutes, stirring once or twice. Throw in the kidney beans and simmer, uncovered, for another 15-20 minutes or until the sauce has thickened slightly. Season well with salt and pepper and set aside. Meanwhile start cooking off the aubergines. Heat a tablespoon or so of oil in a large frying pan (to make things quicker you can have 2 frying pans on the go). When the oil is sizzling, fry batches of the sliced aubergines in a single layer over a medium to high heat until softened and yellowy-golden on both sides. Transfer to a baking tray covered in kitchen paper to drain. Repeat the process, adding a little more oil after each batch, until all the aubergine is cooked. Melt the butter in a small saucepan over a low heat. Add the flour and stir vigorously for two minutes to form a roux. Remove the saucepan from the heat and gradually add the milk in a thin stream, beating all the while to prevent lumps from forming. Return the pot to the heat and bring the sauce to the boil, stirring all the while. Once at a boil, the sauce will thicken slightly. Simmer for 2 minutes, still stirring and then add the cheese, mustard, lemon juice and salt. Stir until the cheese has melted. Remove from the heat. To assemble the moussaka, spoon 1/3 of the tomato-bean mixture into the bottom of your prepared dish. Top with a single layer of aubergine, a little less than a 1/3 of the cheese sauce and then a single layer of sliced potato. Repeat the process twice so that you finish with aubergine and then the cheese sauce. 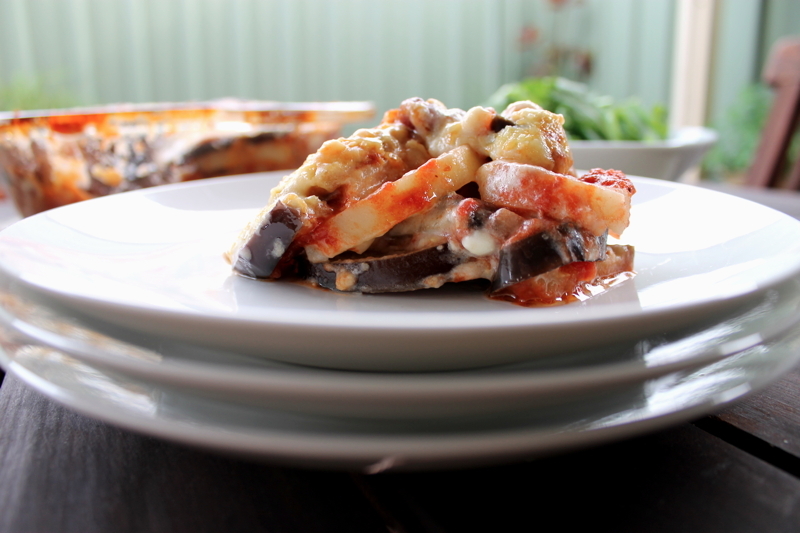 You should have 3 layers of tomato-bean mixture, 3 layers of aubergines and cheese sauce and 2 layers of potato. Sprinkle the 50g of grated cheese over the top and bake for approximately 1 hour or until the top is golden brown and bubbling. Set on a wire rack to ‘rest’ for 10 minutes before serving. Source: Barely adapted from Sam Stern’s Get Cooking.